Are you tired of shooting jerky-looking video? Then you need the Stable-Cam, a unique hand-held camcorder accessory that gives you better looking video -- INSTANTLY. Hundreds of dollars cheaper than Steadicam and Glidecam and much easier to use, this stabilization tool helps you dramatically improve your video productions from home movies to event recording. This is a camcorder accessory that every camcorder owner needs. All you have to do with the Stable-Cam is make one simple connection and you're ready to produce professional video. The Stable-Cam not only improves your video, but makes you look more professional at the same time. AND the Stable-Cam even takes the pain out of long, hand-held recording sessions. It doesn't get much better than that. The Stable-Cam is so easy to use that almost every member of your family (Dogs don't count!) will be able to shoot excellent video. Let eveyone have a turn. You'll be surprised how well they do with the Stable-Cam. The Pocket-Steady - The Pocket Steady folds up and easily fits in your pocket. It's ideal for vidographers on the move. The Stable-Cam Delux Kit - The kit comes with all the features listed as well as the extension arm, the Stable-Cam Extenda-Steady, AND The Pocket Steady. The Stable-Cam attaches to the standard tripod connection. A few turns of the mounting wheel and you're ready to shoot. It's so easy to use, even children can use it. Above the easy-grip handle of the Stable-Cam is a mount for a video light or microphone. With most camcorders you have one mount at the most. Operators have to choose to use either a light or a mic on-camera. The Stable-Cam lets you use both at the same time. The form-fitted handle is easy on the hands. The hand emcompasses the grip easily. 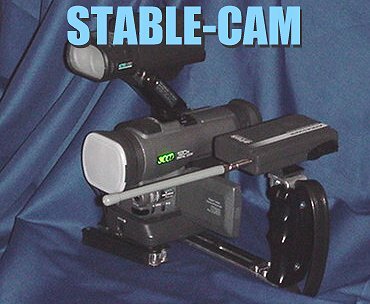 The Stable-Cam allows videographers to use one hand on the camcorder and one on the Stable-Cam, or a mounted camcorder can still be operated by the right hand only. A recording camcorder can even be used with just the left hand, which allows the right hand to stretch and relax. With the vinyl strap around your hand, you can relax the grip of the left hand producing a no-hands grip. 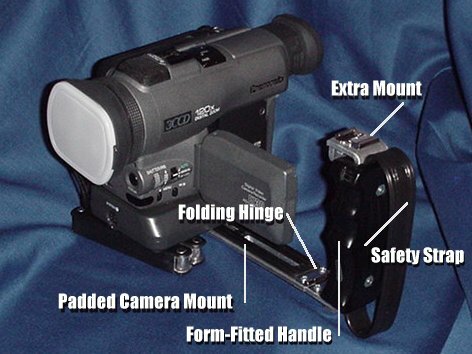 Swing-out video monitors of up to 3.5 inches can be used with the Stable-Cam, AND the Stable-Cam Delux Kit with its Extend-a-Stable arm can accomodate virtually any consumer or professional camcorder. Using a two handed grip and the swing-out monitor allows the operator to record great moving video. As camcorders become smaller and lighter they become harder to stabilize. Although many camcorders have built-in stabilization systems, Electronic Image Stabilization can cause a deteriorization of video quality. Most operators of camcorders with the Stable-Cam prefer to use the camcorders without any EIS. This produces sharper looking video. With EIS and the Stable-Cam produces silky-smoooth camera movement. The Stable-Cam is available for only $69.95 plus $10.00 shipping/handling (U.S. funds). Send company check, money order, or cashier's check for $79.95 to: PNW Video Productions, P.O. Box 191, Tacoma, WA 98401.